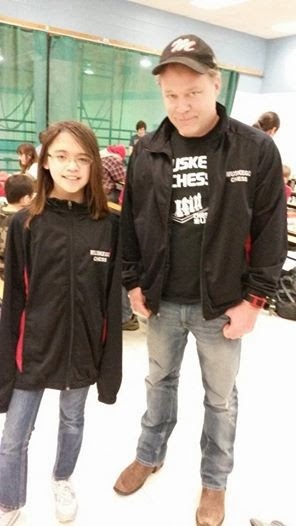 Time Running Out for 2014 Muskego Chess Apparel! HELP SPREAD THE WORD about Muskego Chess this Spring & Summer by proudly wearing your new Muskego Chess merchandise. The new flyer includes shorts & baseball caps. If you're still interested in the fall/winter form (w/the pj & sweat pants & bag, we still have that available too). These aren't just for the chess players, but are also for their families & friends too. Would make great presents for people w/mother’s day, father’s day, grandparents day, etc coming up. $2 from every item goes to support Muskego Chess, to pay for Matt/Danny's instruction, wrist bands, boards, pieces, clocks, etc. NOTE: One typo on the order form. Youth track jackets are $32, like adults. Contact Leah Przedwiecki (leahmike@ymail.com) for further info- she'll have the forms at next class, or she could email you one. Act quickly! Only one more batch of orders this season, then we're done with merchandise until next year! MUSKEGO CHESS FAMILIES - Your child really into chess? Try the Southwest Chess Club. On Thursday nights, there is a great club called the Southwest Chess Club. They meet weekly in Hales Corners, in the basement of the police station/town hall (click here for map). Kids from 4 to 84 years old meet to play USCF-rated chess games. Cost is usually $5 to play in a USCF rated tournament. Great group of guys run this. Robin Grochowski and Tom Fogec are the two main guys. If your child is really into chess, this is the next step. A few of us will be there tonight for this ONE NIGHT tournament with three short games. Note- you'll get to sleep a bit late tonight. Details are below in the email from Tom. Mill Valley Chess During the Day! Congratulations to MV Principal, Robin Schrot, and teacher Justin Geiger, who have started a chess program at Mill Valley during the day, once a week. I met with both of them this morning and was so happy to hear of their support for the game of chess. This would be a great thing to start at all MNSD schools! Maybe something for parents to suggest to teachers. I'm sure we have more teachers who know how to play chess that could get this started like Justin has done at Mill Valley! It's been a fun year for the High School conference (SMCA)! Our team of Sophomores, Freshmen, and younger players joining the mix from time to time has done well, and had a great time with some very interesting games and matches. We ended the year Tuesday with a win over Kewaskum, winning 6 of 7 boards and drawing the other 1. Our Jayvee team, consisting of regulars Jacob, Sam, John with strong assistance from Will, Kyle, Jack, Elliot, and Brian, also did very well, finishing in 4th place. We started very strong in JV, winning our first 4 matches before conflicts kicked in and we had to do some very quick substitutions. This is an IAC Grand Prix event for all skill levels Blue and up. 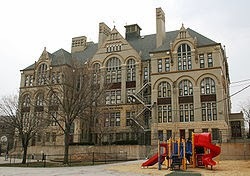 Lots of fun was had by all at a great tournament near downtown Milwaukee at the famous Golda Meir School. The MSCC had 22 kids attend! This was a large tournament and was well-run with lots of space. K-12: Our K-12 team for MHS of Evan, Jason, Reid, Kolton and Sam took home the 1st place Team Trophy with 18.5 points, beating 2nd place Bradly Tech who had 14. K-6: Our K-6 team for LDMS of Kyle, Will, Willow, Nick and Kenny also took home the 1st place Team Trophy with 17.5 points, beating 2nd place Clara Mohammed who had 15. 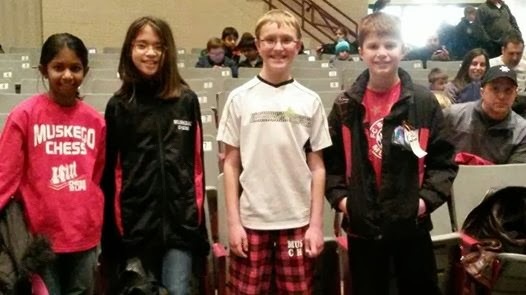 Close behind, in 4th place, we had Bay Lane Middle School (Noah, Alyssa, Anoushka and David) with 13.5, outperforming other full teams at Bayside and Goodrich. 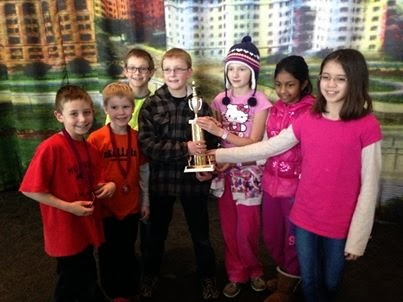 K-3: Our K-3 team for Mill Valley of Nelson, Gavin, Joel, Evan and Makayla finished a close 2nd behind hosts Golda Meir. Kyle Jain for going a perfect 6-0 to win the K-6 division! Kyle's performance has been impressive this year - and it's no wonder why - Kyle plays a lot of online games, and studies openings, does chess tactics, watches videos, etc. Hard work pays off! Way to go, Kyle! Will Schantz for going 5-1 to take 4th on tie-breakers. After 4 rounds, Kyle and Will were the only 2 kids out of the 51 in K-6 division who were 5-0, and they had the option to play each other or to play different kids. They chose to play different kids, which gave them both a shot to win. Great tournament for you both! Noah Gover for winning 4 out of 6 and earning his RED wrist band! Tournament FIRST TIMERS Kenny Mies, Colin Mies, Mikayla Steuer, and Nolan Schuster! You have taken an important step forward. First grader Nolan Schuster, who was there just to watch his brother Nick (part of our first place K6 team for LDMS), but who decided at the last minute to jump into the tournament at the last minute. This took a lot of courage for such a young kid with no experience. Nolan played some good games, and I could tell between rounds that he is learning quickly! Mill Valley 3rd graders Nelson Klein and Gavin Joers for going 4-2 to lead the K-3 team! good job also to Joel and Evan for each earning 2.5 points for the team, and Makaya 2 more! 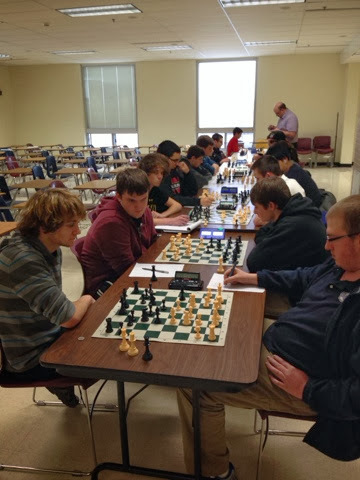 ALL of the MSCC participants who generally played SMART chess, making sure to think before they touched those pieces. Bob Patterson-Sumwaldt, the tournament leader, congratulated Muskego on our results, and several other parents and leaders had good things to say about our well-behaved kids. BIG THANKS also to Leah Przedwiecki for bringing all the awesome MSCC apparel! We looked like a real club thanks to her. Leah will bring the rest of the orders to class on Monday. I love my MUSKEGO CHESS jacket especially. A great time was had by all at Golda Meir - we will post results here as soon as they are made available to us....! Thanks! Big Day Saturday at Golda Meir! If you have ordered MSCC apparel (t-shirts etc), Leah is bringing this stuff to the Golda Meir tournament on Saturday for pickup! 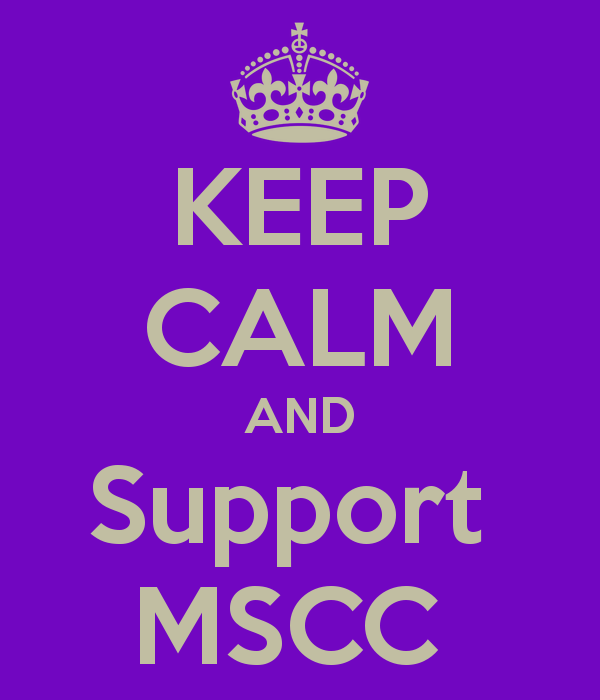 You can change there if you'd like to wear your new MSCC shirt! If you aren't attending the tournament, she is also bringing stuff next Wednesday at class. Here is the link to the flyer again for information about the tournament. Here is the link to a map to the school. Dan S and I will be there early to help set up. Please be there before 8:15 for registration, which closes early this time at 8:30! Everybody should be pre-registered (if you have already emailed me)- click this link if you're not sure- if you are pre-registered, just pay $10 at the door. The tournament should be over by about 4pm or earlier. They will have food and beverages there for purchase throughout the day. There will be 6 rounds of chess. We will be playing chess and going over games between rounds. Please email me with any questions you may have- or if you'd still like to attend. Seghers@gmail.com - thanks! Green and White - watch our videos! Watch our Videos! They contain all you need to know to earn your Blue wrist band and be ready for tournaments! Click here to watch them, OR see "CHESS RESOURCES" on the right of this screen, and Click on Videos (Watch now). We had 5 regulars unavailable for this match due to driver's ed, stage crew and other reasons, and 2 subs had to pull out last minute unavoidably. This left us with a skeleton crew of 5 regulars and 2 subs. Despite this, our Varsity Team of Evan, Jason, Reid, Jacob and Will won 30-10 against Hartford. The only loss was Evan losing to their top board, a very tough player. Our only two JV boards, Sam and Kyle, both won. Pretty good season so far with only one more game to go! Next year, we just have to find a way to field a regular team every week. Next year we will probably have more players to draw from. Golda Meir signups are strong except for Tess Corners- would be fun to have a team from TC for GM! Still time to sign up. Next tournament is Elmwood - see the chess calendar for details - no flyer available yet but great tournament for all ages and skill levels. March is a CRAZY month for chess. First high school conference year-end tournament, then Elmwood, then State, then Grade Level. April 5th is the All Girls Tournament! Email Mark or Leah to register for this. Leah will be sending information to all girls about this tournament. Here is the link to the flyer. March 26th is probably our final class of the year. After All Girls, we may also attend additional tournaments (including in Summer) as a group. The SouthWest Chess Club is also a great place to go for USCF tournaments year-round. See "Resources" for more information on the right side of this blog. 4 regulars missing for our match visiting Hartford tomorrow, bringing 4 from Lake Denoon! Back to full strength next week for our final match at HOME at Muskego High School. Below is who we have signed up for Golda Meir tournament on Feb 22 - let me know if I missed anyone! Anyone from Tess Corners interested?? Still time to register for the $10 entry fee. Note 2/20: added Brian Mark (LDMS k12) and Nick Schuster (LDMS k6) to the roster. Wow- hard to believe this is only a month away! 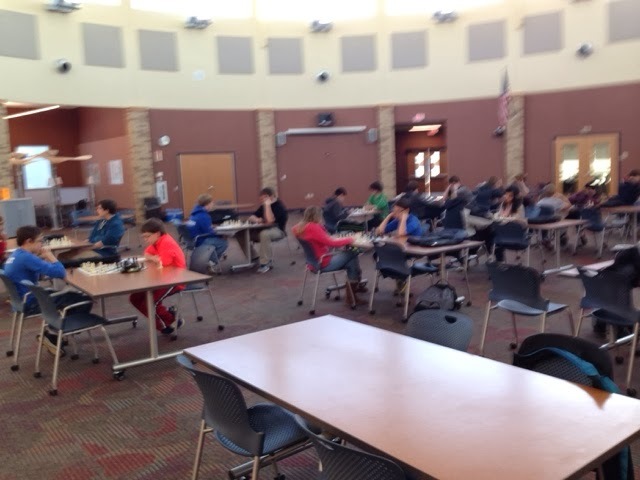 I have emailed parents the flyers - This is the annual STATE chess tournament, and a hugely fun tournament for kids interested in competing in chess at the state level. There are several divisions, and kids who compete together must be in the same School. Kids can also compete on their own, individually, for fun. In the past, Mill Valley has have won K-5 twice (and our name is on the trophy twice), and Lake Denoon came very close to winning K-8. Evan Seghers won 1st place in K-8 a couple years back. The Bay Lane team has also finished close to first in K-8 when Mr. Reese ran that program. Last year, our team of Freshmen finished 5th out of 18 high schools in division 1- it is our goal to improve that this year. This year, we will be fielding at least one team - D1 Varsity for Muskego High School - and probably a JV team as well. We could also field a K-8 team or a K-5 if there is interest. This is a two-day event, held at UW-Oshkosh on campus (during their spring break). Some people get a hotel room (there are a couple with big pools), and some may choose the dorm, which is fun in its own way, and very inexpensive! Please see below and attached, and let me know if you are interested- or any questions you may have. This is a REALLY FUN event! Please let me know if you do not have the email about this event with all the details, and I will email it to you. Congrats to MHS Varsity for winning a close one at New Berlin West last night! Congrats also to Jake Gomoll (whose new rating places him at board 4 of varsity for tonight's match) for winning a nice game on board 6, and a big THANKS to our Lake Denoon boys for joining us to give us a shot in JV! games underway against the very tough new berlin west team. due to conflicts, we have three joining us from lake denoon! The Muskego High School team will play against St. Mary's AT HOME after school on Wednesday, Feb 12. This is a makeup match from a couple weeks ago. 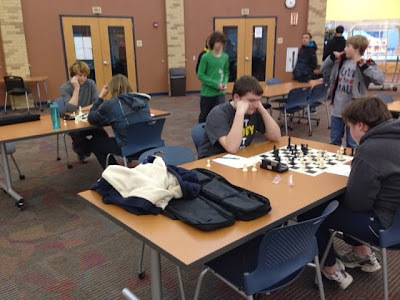 I thought we could order Jimmy John's after, for whoever wants to, and kids could possibly study or play chess between this high school match and our normal chess program. Apparel Order Sheets Due Wednesday 2/5!!! 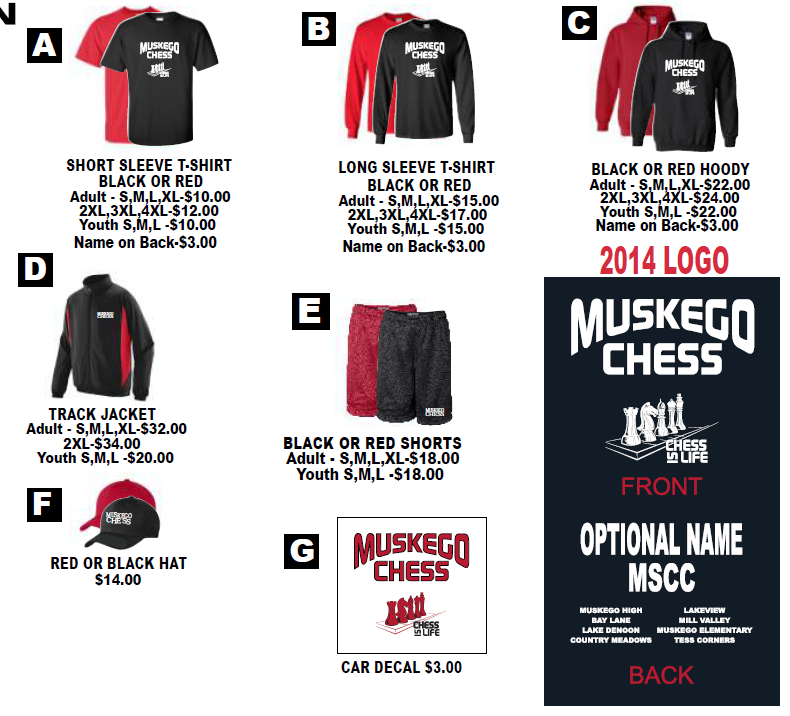 Please note- all Muskego Chess apparel orders are due Wednesday! There will be forms to fill out there at class. 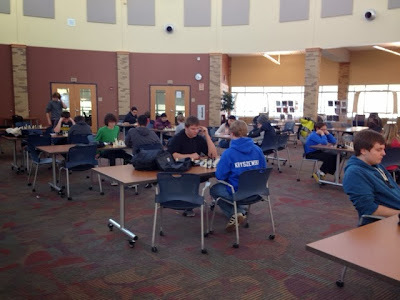 Remember, $2 for every item except sport jacket ($0) go to support the Muskego Scholastic Chess Club. Also, wearing the items draws attention to the club, and to chess! Lots of fun at Discovery World! Thanks to the parents (especially Dan S) who got us our own area and for Will for making the little signs. Lots of focus on chess, even with all the distractions, and it showed in our results. Some kids had to "Play Up" because their rating was higher than what was allowed for this tournament for their grade level. In K3, Nate May and Alex Swieszynski both won 3.5 out of 5 to earn their RED wrist bands! Joel went 3 out of 5, Great work, guys! Joshua Kierzek and Noah Church also added 2 wins to the Muskego Club Team who won the 3rd place trophy, missing 2nd by only half a point! In K6, David Bundy took 4.5 wins out of 5 and earned the 2nd place individual trophy (and his red wrist band). Anoushka Prasad, Gavin Joers (playing up from K3) and Alyssa Przedwiecki took 3 out of 5. Nelson Klein (playing up), Dylan Cleveland, Willow Otterbacher and Mitchell Salentine added 2 points each to the team, and Steven Wauer also helped out with a win, as our K6 team took 2nd place, losing only to the strong Golda Meir team. We were in first for much of the day! In K12, Evan Seghers was inconsolable after losing his first game, and took a walk in the snow. He returned to win his next 4 games and take first place overall (and win a family membership to Discovery World which he is giving to his triplet cousins for their birthday). Reid Seghers added 3.5 out of 5, Will Schantz 3 out of 5 (playing up from K6), Kolton Otterbacher 2, Kyle Jain 2 (playing up from K6) and Brian Mark added a win to the team effort. Our K12 team including three LDMS players and three MHS players finished in 1st place overall. Great job!